This unique two-step method of making these Brutti ma Buoni provides the perfect texture you come to expect from a meringue cookie. Crunchy on the outside, chewy on the inside. The combination of roasted nuts makes this Italian Hazelnut Almond Meringue recipe truly sensational! This recipe was originally published on December 13, 2015 and republished on November 22, 2018 with updated content, photos and a video (located in the recipe card). Thanks for watching and sharing. 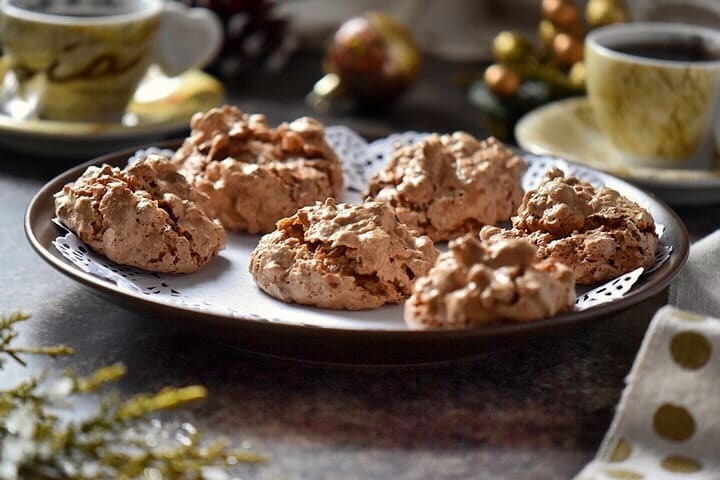 When you first bite into these Italian Hazelnut Almond Meringues, your initial sensation will be that of a crispy exterior, followed by a soft, chewy interior. 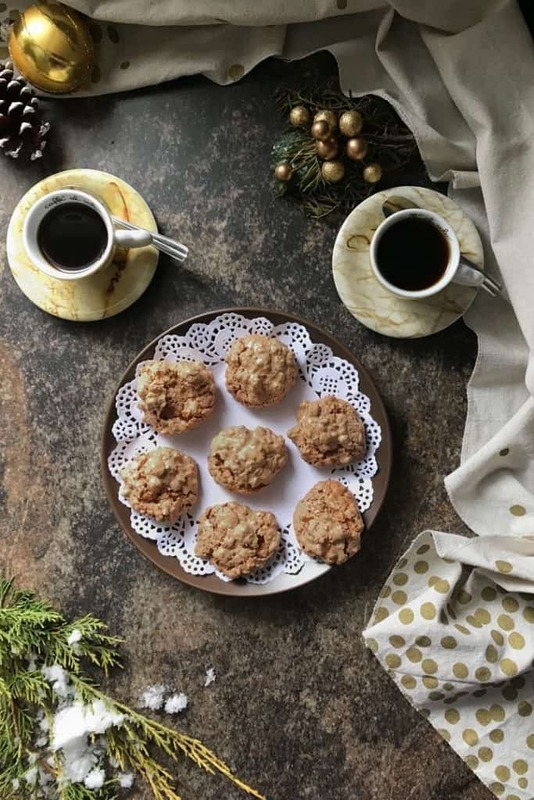 Just like this family recipe for Mostaccioli or this simple recipe for Amaretti, these Brutti ma Buoni cookies are a great addition to your platter of Italian Christmas cookies. Apparently, the first person to come up with the genius idea of adding nuts to a meringue based cookie was a pastry chef in the region of Lombardi in 1878. His name was Constantino Veniani, and he owned a pastry shop in a small town called Gavirate, just north of Milan. He called these cookies brutti ma buoni, which literally translates into ugly but good. Since beauty is in the eye of the beholder, I will let you decide if these cookies merit the description of being ugly… As far as the taste goes, I would describe them as exceptional. What do I need to make Brutti ma Buoni? Egg whites. An essential component to make a great Italian meringue cookie. Vanilla Extract. No imitation will do, use the real thing and you will actually taste the difference. Cinnamon. Just a bit to give the meringue a little kick. Sugar. Another crucial ingredient when making this classic meringue cookie. Almonds. Roasted and with the skin on. Hazelnuts. These will also be roasted but we need to remove their skins. 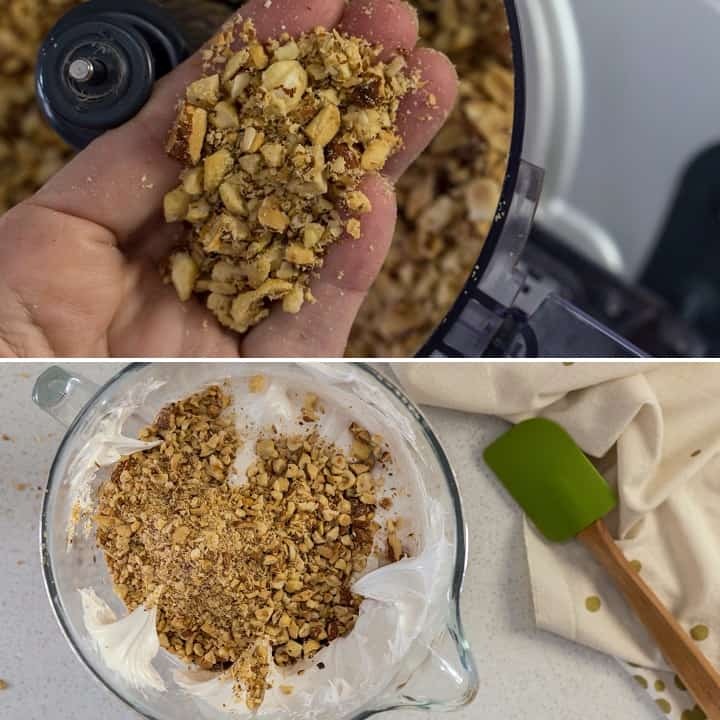 As far as accessories are concerned, a food processor to grind the nuts makes this whole process so much easier than manually chopping them up. You will also need a stand mixer (or handheld mixer) to whisk the egg whites properly. A small pot, a heat proof bowl, a wooden spoon and a medium-sized ice cream scoop will ensure equal sized cookies. Finally, we will need a cookie sheet lined with parchment paper. 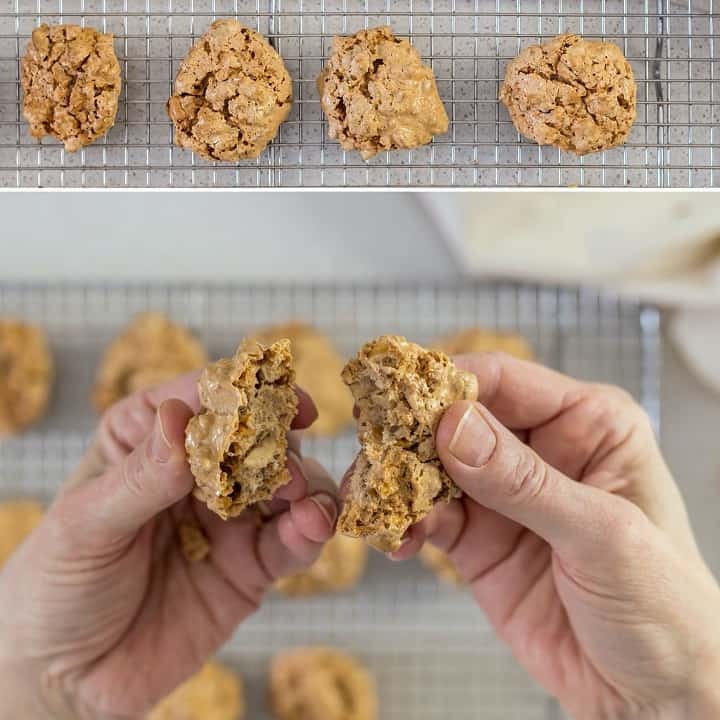 It’s now time to make this wonderful gluten-free cookie! Are you ready? This recipe for these Italian Meringue cookies is unique as it requires both roasted hazelnuts and almonds. Once roasted, use your food processor to obtain coarsely chopped nuts. Set them aside while you make the meringue. The meringue has its humble beginnings in egg whites. With the help of your stand mixer and the whisk attachment, it only takes about 10 minutes to get your eggs whipped up into stiff glossy peaks. Start your mixture on low-speed and as your egg whites begin to foam, add the salt, cinnamon and vanilla extract. Gradually add the sugar, one tablespoon at a time. Before you know it, the mixture becomes super glossy and stiff. Gently fold in the chopped hazelnuts and almonds. Transfer this mixture in a heat proof bowl and place over a pot of hot, barely simmering water. Stir every few minutes or so for about 15 minutes. Notice how the mixture appears a little darker and slightly “deflated”. The hazelnut and almond meringues are now ready to be baked. Portion with a medium sized scooper in order to obtain about two dozen cookies. Bake in oven for about 30 minutes. Allow to cool completely before “peeling” them off the parchment paper. The almonds and the hazelnuts can be roasted in advance and stored at room temperature until needed. 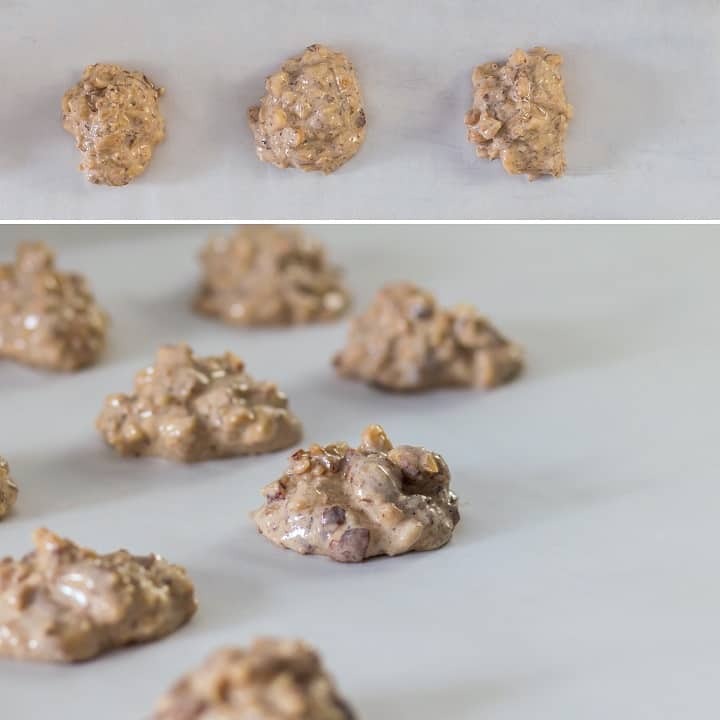 This ensures the use of room temperature ingredients until you are ready to make these nut cookies. Do not rush the process of adding the sugar while whisking the egg whites. Add the sugar one tablespoon at a time. The addition of cinnamon is optional. If you’re a chocolate lover, feel free to add a few shavings of chocolate to make a non-traditional version. What can I make with crushed cookies? Crushed Brutti ma Buoni cookies are great sprinkled over Grilled Peaches or a Ricotta Parfait. I have previously mentioned that I would often collect newspaper clippings of recipes from the Wednesday edition of my local paper. Imagine how delighted I was when I found this Brutti ma Buoni recipe in the food section. I have been making this particular recipe for over twenty years and it has never disappointed. 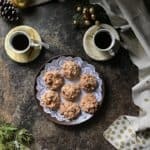 Both family and friends are thrilled whenever I make this Italian cookie recipe to be part of our Christmas celebrations. I am confident they will quickly become part of the best Christmas cookie recipes you bake for the holidays. 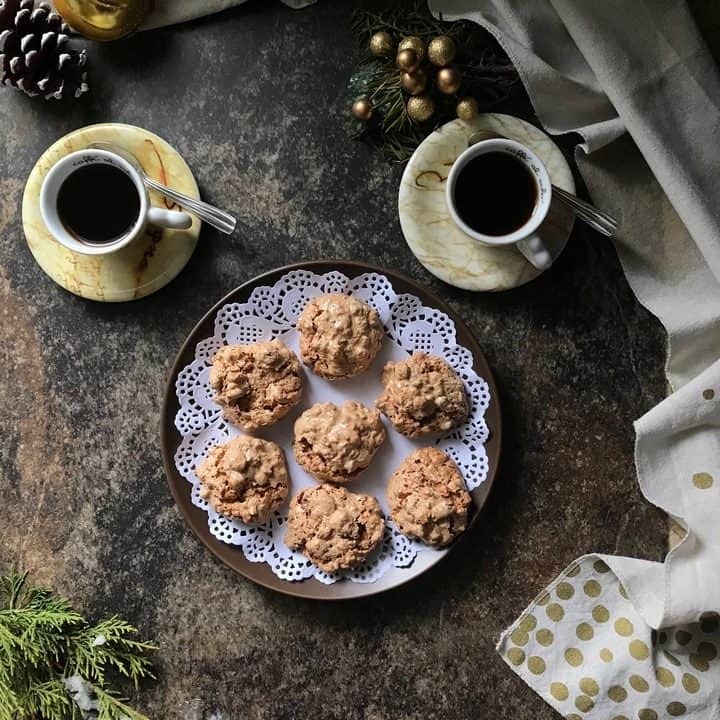 ★★★★★ If you have made this Brutti ma Buoni recipe, I would love to hear about it in the comments below and be sure to rate the recipe! 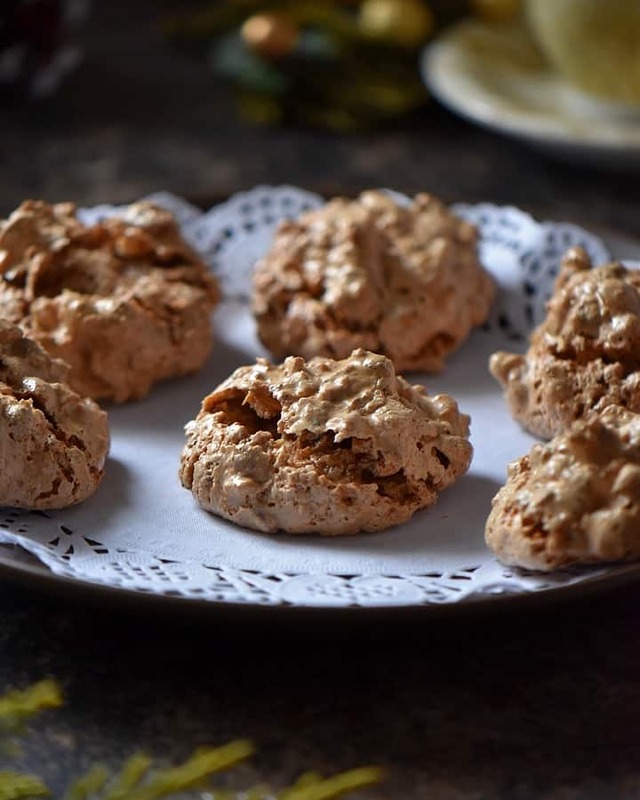 When you bite into these Brutti ma Buoni aka Italian Hazelnut Almond Meringues, you will notice a crispy exterior and a soft, chewy interior. Truly a great addition to your Christmas cookie platter. Line baking sheet with parchment paper. Set aside. Pulse almonds and hazelnuts in a food processor to obtain a coarsely ground texture. Alternatively, chop by hand. Set aside. 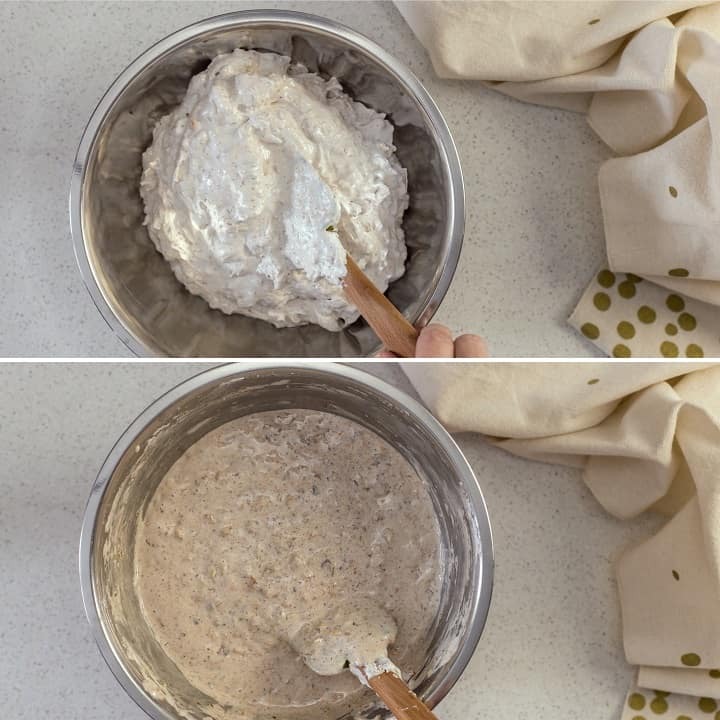 In a large mixing bowl (of a stand mixture), with whisk attachment, beat the egg whites on low-medium speed until they start to foam. Add cinnamon and vanilla extract. Add the sugar, a tablespoon at a time, Whisk until you obtain stiff glossy peaks. With a mixing spoon, fold in the nuts. Gently combine. Transfer this mixture to a heat proof bowl and place over a pot of hot, barely simmering water. This mixture needs to be stirred for about 15 minutes. Portion with a medium-sized scooper and place on baking sheet. Bake for approximately 30 minutes or until tops are golden. Allow to cool on baking sheet. To roast the nuts: Preheat oven to 325°F. Position rack to the center. Spread almonds and hazelnuts on a baking sheet and roast for about 10 minutes to obtain a light roasting. Remove the skins from the hazelnuts. Let the nuts cool to room temperature before using them in the recipe. Do not rush the process of adding the sugar while whisking the egg whites. Add the sugar one tablespoon at a time to the egg whites. 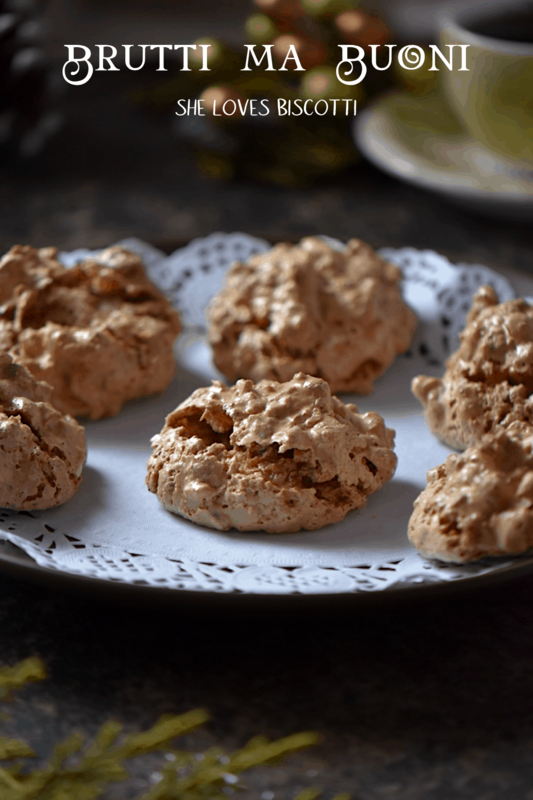 IF YOU ENJOYED THIS BRUTTI MA BUONI RECIPE, SAVE IT FOR LATER. PIN IT TO YOUR ITALIAN CHRISTMAS COOKIE BOARD! i made these today and they smell heavenly!! but they never really got golden on top so I kept waiting. When I took them out at 25 minutes, sadly the bottoms were burned. SO BUMMED OUT!! I would just say watch your oven very carefully. I think they were probably done at 22 minutes but i didn’t want to take them out prematurely. (I have an oven thermometer, so my oven is accurate.) I may try again! I also have a question: do you know what the purpose is of the 15 minutes over boiling water? Just curious as I’ve not encountered that before. How coincidental. I’ve wanted to make these for forever, and finally got around to it a couple of weeks ago. Yours look absolutely wonderful. Thank you for a great recipe. In the oven right now, very exited to taste result. One question, why do you heat the mixture at the end? In the oven as we speak. My remembrance of a similar cookie came from my Green Bay roots and a phenomenal German baker named Otto Kaap. I have searched and searched for a chewy nut cookie. I think Otto mixed a few nuts and minced and toasted them all together which is what I did. Didn’t have hazelnut, dag nab it, but used pecan, walnut and almond. Meringue based is a great idea becuz they definitely need to be crispy on outside and chewy inside. So excited!!!!!!! Thank you!!!!!!!! Baked and sliced and sprinkled with icing sugar. Fantastic! Been looking everywhere for this cookie recipe. The one person who I know makes them will not share the recipe! Gotcha sucker!??? ?